When was the last time you had a chimney cleaning? If not properly cleaned, oil burner and gas burner chimneys can become dangerous over time. In oil burner chimneys, soot and clay can build up and prevent fumes from being vented away from your house. Gas burners, especially older ones, might have blockage from old terracotta linings, preventing ventilation. Just because you can’t see soot build-up in your gas furnace doesn’t mean there’s no corrosive or dangerous substances in your chimney. Without the proper system to ventilate your chimney, dangerous gases such as carbon monoxide can build up and release into the air. Don’t put your family at risk by ignoring your chimneys! 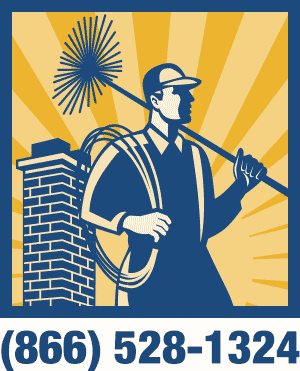 We take great pride in our chimney cleaning services. If you have an oil burning furnace we will clean your chimney from the roof first, pushing down any debris that might be blocking your chimney. We will then disconnect the pipe from the furnace to the flue and thoroughly clean out the soot and clay from the pipe before reconnecting it to the flue. We will also inspect the interior and exterior of your chimney to make sure there are no cracks, gaps or missing joints. We won’t leave until we make sure that all fire safety hazards are taken care of and removed. How often should my chimney be inspected and cleaned? Since carbon monoxide is an odorless and colorless gas, it’s wise to have your gas burner or oil checked at least once a year before the cold months. The Chimney Safety Institute of America and National Fire Protection Agency recommend annual chimney inspections. You were referred by Petro, who maintains my heating equipment. After a normal scheduled maintenance visit, Petro’s technician noticed that my chimney cap had blown away, and that due to missing cap, water could enter the chimney, which obviously was not good for the burner, and other equipment. Ricky, from your office, arrived promptly at my home, verified what Petro had noted, and explained what needed to be done. I was so impressed by Ricky’s polite and professional explanation of what was wrong. I authorized those necessary repairs right on the spot. The work was done promptly and neatly. I would not only call your company again, without hesitation, but I would also refer you to any friends, neighbors, or relatives , that needed help with the areas that you specialize, such a chimney’s and masonry. I wanted to personally thank your company, as well as Ricky. People are so quick to pick up the phone (or email these days) to file a complaint, or to express dissatisfaction but when they are extremely happy, they don’t do a thing. I think if you are able to spend the time to complain, you should be willing to do the same when you are very satisfied. I would appreciate if you could make sure that Ricky’s boss sees this email. I would also appreciate if you could also let Petro know how satisfied I am, and/or forward this email to them.